What’s next for Jacoby Jones? For National Football Authority, we break down the reasons that the Houston Texans released WR Jacoby Jones. We analyze what Jones is (and isn’t) at this point in his career, and what teams should be interested. Click here to read all about it. Will Byron Leftwich mentor Andrew Luck in Indy? For National Football Authority, we look at the rumors that the Indianapolis Colts are looking at Byron Leftwich as the backup to Andrew Luck. We look at what Leftwich could add to the Colts, and what problems he could cause if given too significant a role. Click here to read all about it. 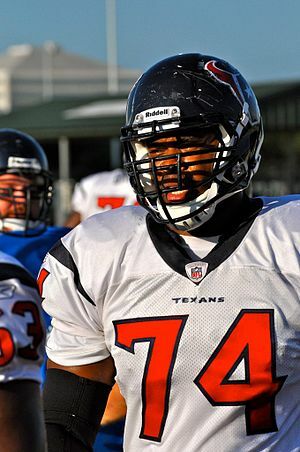 For National Football Authority, I had the chance to interview Houston Texans OG Wade Smith. We talked about how the Texans will respond to losing two starting offensive linemen and other key players, why Arian Foster is so successful, and his upcoming charity event in his hometown of Dallas. Smith provided great insight, so it’s a good read. Click here to read all about it. For National Football Authority, we break down the ripple effect that MLB Curtis Lofton is leaving across the NFC South. What will he mean to his new team, the Saints? What will his departure mean to his old team, the Falcons? And what does the fact that the Buccaneers pursued him say about their plans? Click here to read all about it.